I haven't seen Blade in a while, but one of my primary memories of the film is when Wesley Snipes whips out his multi-bladed chakram and wipes out like, five thousand vampires at once. Blood everywhere! Sunglasses! Trenchcoat! The latest video from Man at Arms has resident crafter Tony Swatton forging the chakram from Blade. After which point, of course, they cut stuff with it. 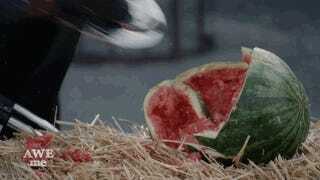 Take that, watermelon! Note: Chakram, not glaive. For more, see commenter McRedhead.